I’d been to Animal a few years ago, back when California still allowed people to eat foie gras. I’ve been curious to go back, especially with all of the hype that chefs Shook & Dotollo seem to garner in the media. But there are so many wonderful restaurants in LA that I haven’t been to, it’s hard to justify repeats. Every year we go for dinner with friends from LA (that in previous posts, I’ve referred to as the picky/particular-eating Banker and his wife Mel), and I get a great local’s perspective on what’s new/hot in LA from Mel. Even though I usually make all of the dinner plans for the weekend, I was feeling burnt out from all of the travel (and thus travel planning) I’ve been doing lately. I left the our evening’s choice for dinner in Mel’s food loving hands. I was happy to learn that she chose Animal, knowing the menu was “challenging”, and I would not have to sell others on the choice, nor would I feel stress if others didn’t enjoy it because it wasn’t my choice to begin with. People talk about Animal as serving “dude food”, not shy in serving animal bits and pieces. Funny enough, around our table it was the women who were excited about the offerings on the menu. Mel in particular had to be told more than once, that “she couldn’t order one of everything on the menu”. Not everything, but we sure came close. 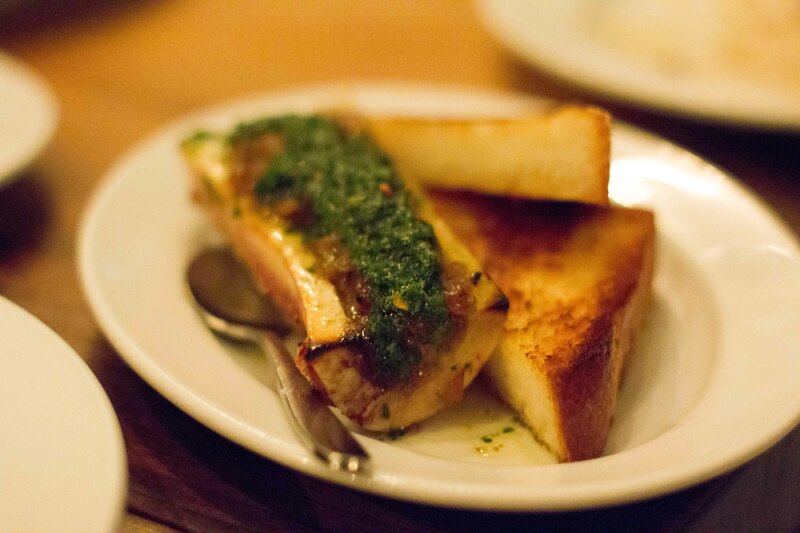 Marrow bone, chimichurri, caramelized onions – I loved this the last time and it was one of my favourites again, but I’m a sucker for bone marrow. I had more than my share of this dish, which probably led to me not enjoying other dishes as much as I should have. 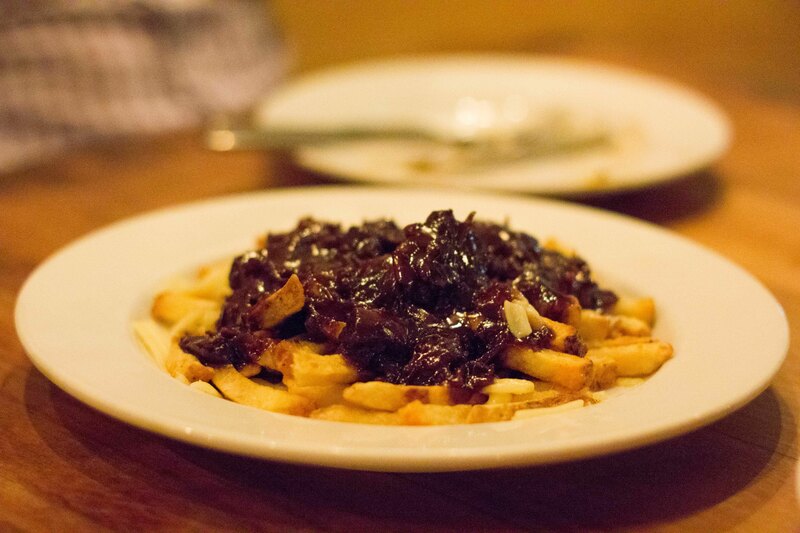 Poutine, oxtail gravy, cheddar – ranked close to the top on almost everyone’s list, the rich gravy had us Mmmmmm-ing around the table. 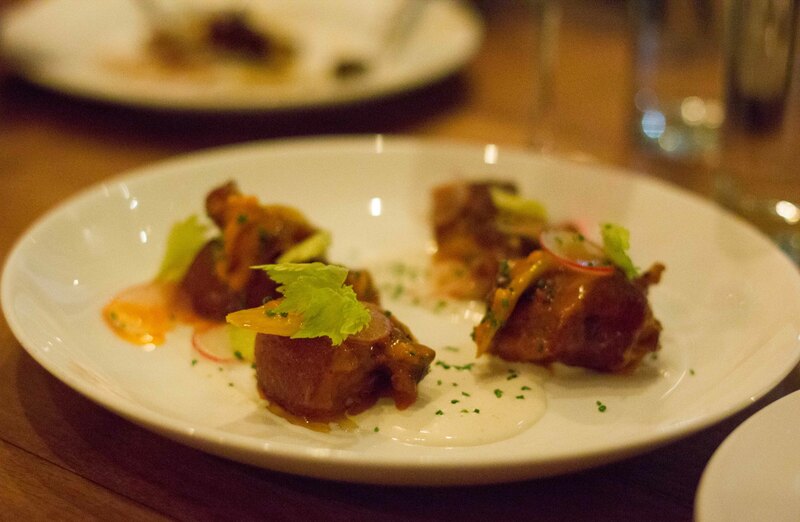 Pig tails, “buffalo style,” celery, ranch – in my mind, this was going to be the most “challenging dish”. It turns out tails, are just cartilage with meat attached. Deep-fried and smothered in buffalo sauce = lip smacking good! 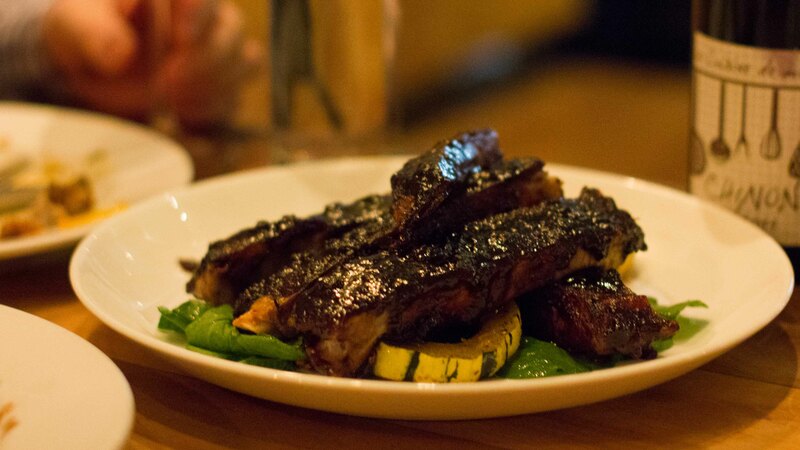 Balsamic pork ribs, delicata squash, spiced pecan, arugula – Ribs seemed too basic to be on this menu, but of course they were deliciously sticky and pull off the bone good. The fat soaked squash underneath was amazing too. 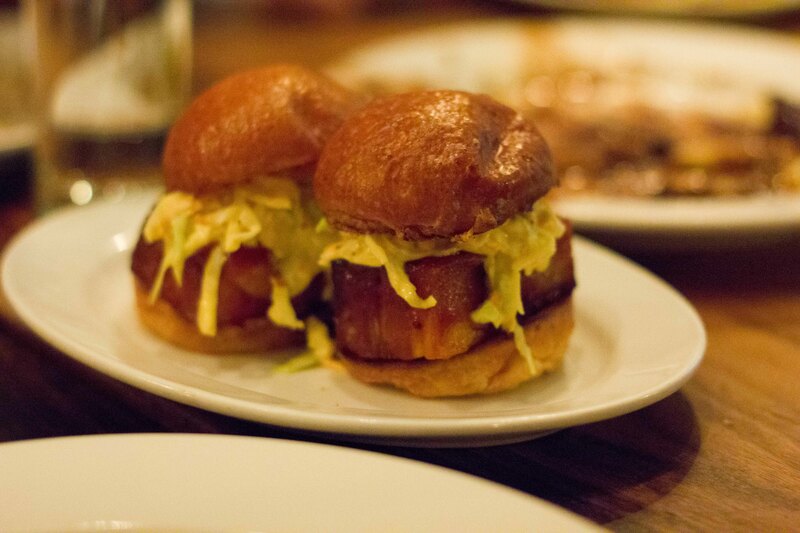 Barbeque pork belly sandwiches, slaw – super moist, deceiving filling. I was full but had to finish my portion (which I couldn’t say about everything else). 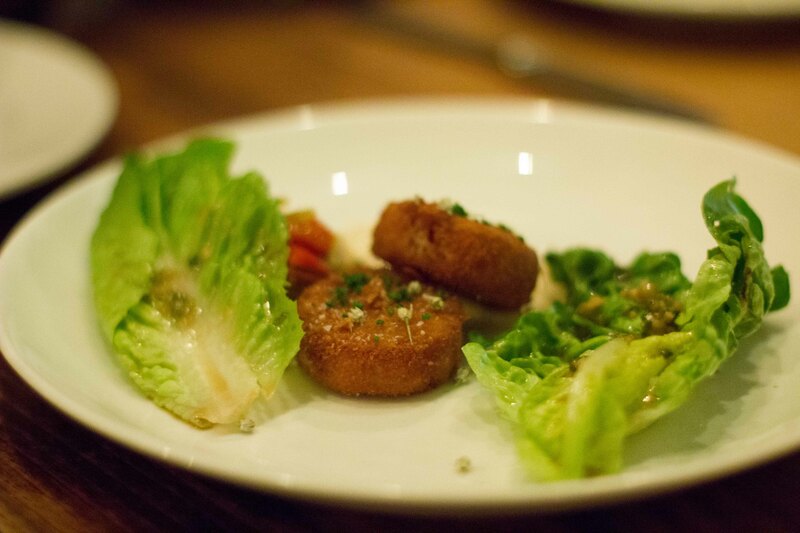 Crispy pig head, chow chow, ginger-scallion vinaigrette – pig head in concept is much scarier than in reality (I think people think the whole noggin will be served). Served here, disguised as a chicken nugget, this was an easy eat. 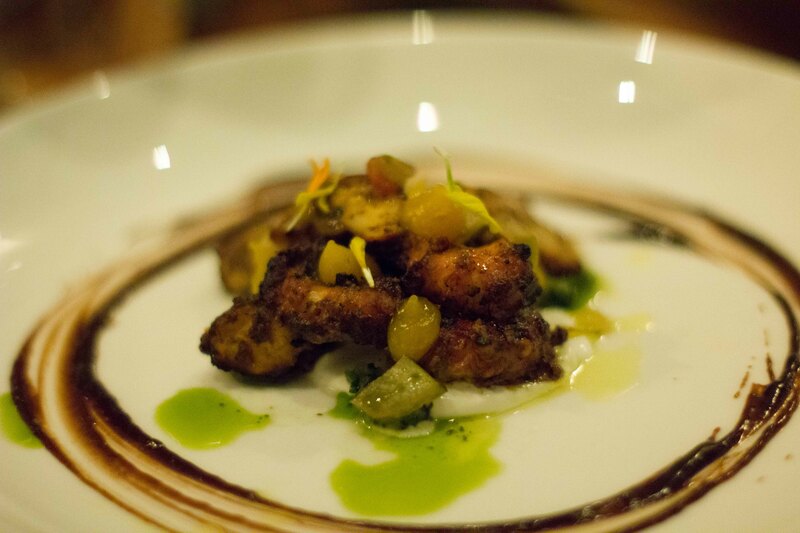 Tandoori octopus, tamarind, mango, raita – rated highly by some, I thought this was good, not great. Biased because it was taking room where more meat could be. 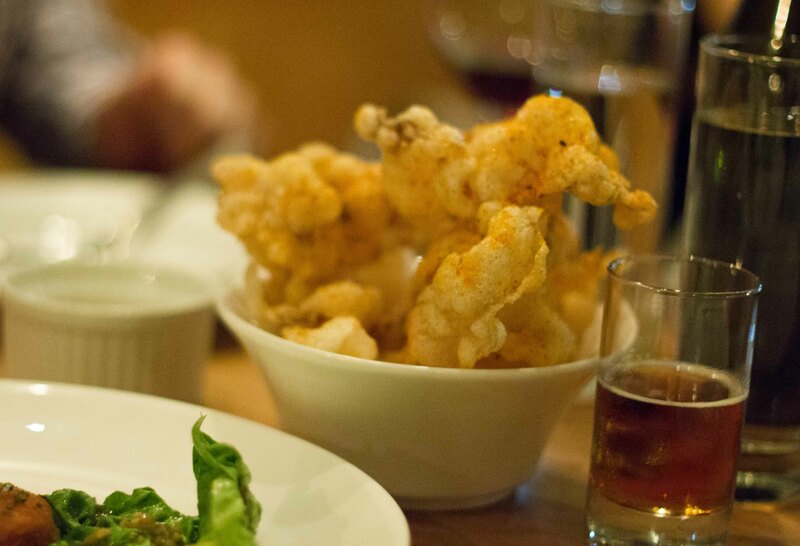 Chicken fried sweetbreads, finger lime aioli, cumin – some people’s favourite. 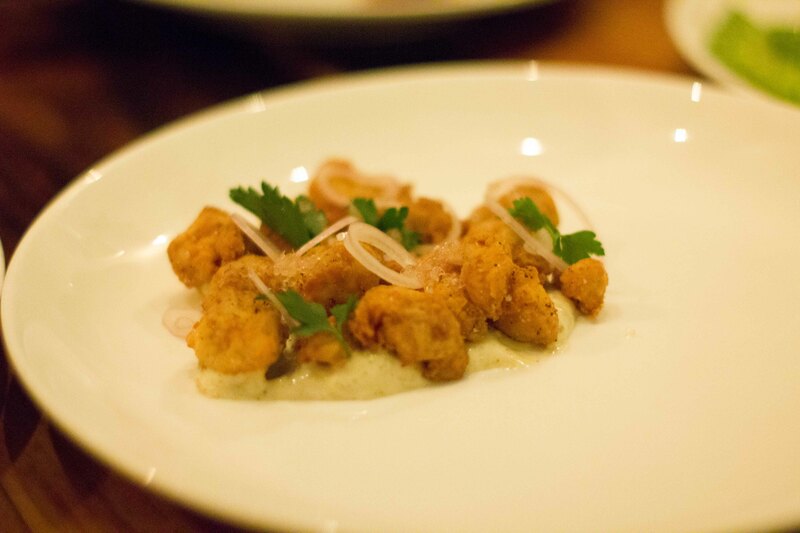 I’m just learning to appreciate sweetbreads, and these helped to convert me. I’m back and forth of whether this should sit here or in the HIT’s category. 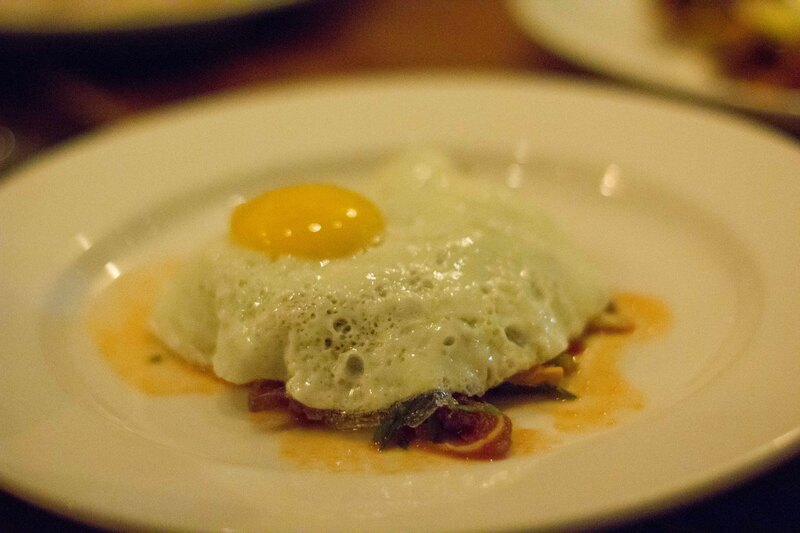 Pig ear, chili, lime, fried egg – like thinly sliced crispy bacon with a kick of chili, I enjoyed these but could have done without the egg on top. Maybe I was just getting full because I usually like an egg on everything. 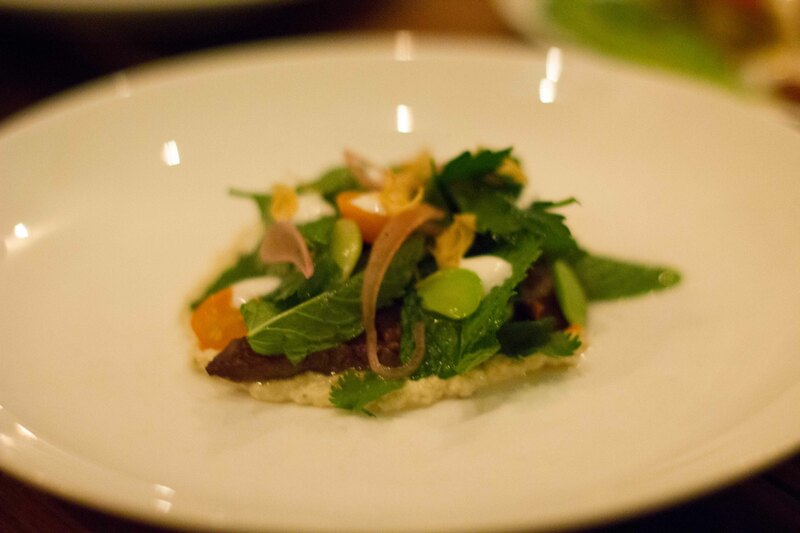 Beef heart, baba ganoush, lima bean, dried cherry tomato, harissa – funny that we although we compared the heart to shoe leather, that was actually a complement. 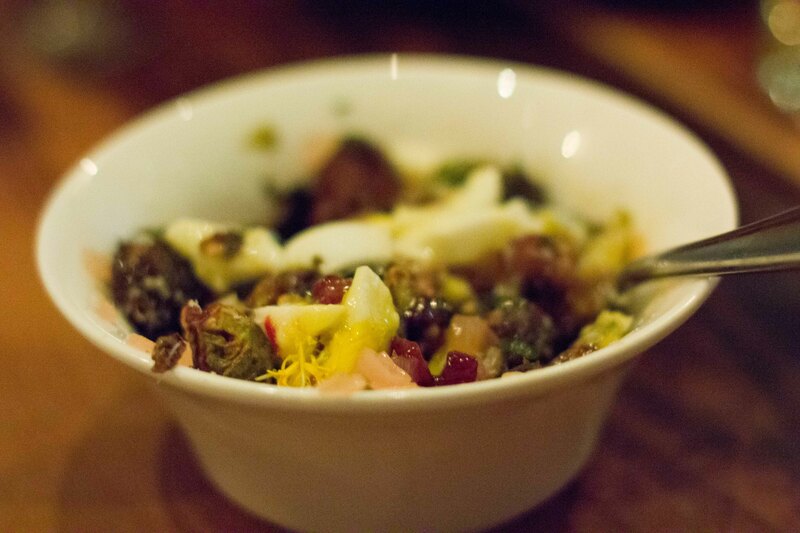 Fried brussels sprouts, soft egg, parmesan, pancetta – I usually love brussels sprouts, but could have done without this dish. Maybe greens had no business being a part of our dinner. This was a meal that challenged not only our palates but our minds as well. We all had our hard limits, as we’d find throughout the course of the meal. I stated mine right off the bat, no brains. Ben was ok with everything but the too rich bone marrow. Funny enough, the Banker did a great job through the meal although claiming pig tails as his only “no go”. I realized that if you could discard with the notion that eating head, ear, tail, etc. was gross, that most would agree that the bits and pieces could be delicious if prepared properly, (not brains, never brains). I know this kind of eating isn’t for everyone, but I believe more people should leave their preconceived notions at the door and just enjoy like we did. Although we were stuffed, we had to order dessert. I have had Animal’s famous bacon chocolate bar before and remembered it didn’t wow me, but wanted to give it another try. 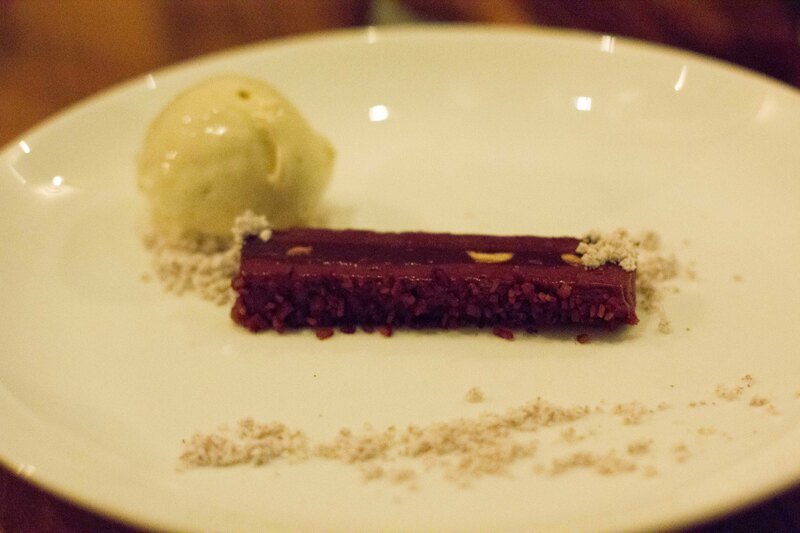 Bacon chocolate crunch bar, s&p ice cream – same verdict as before. Good but not bacon-y enough for my liking. 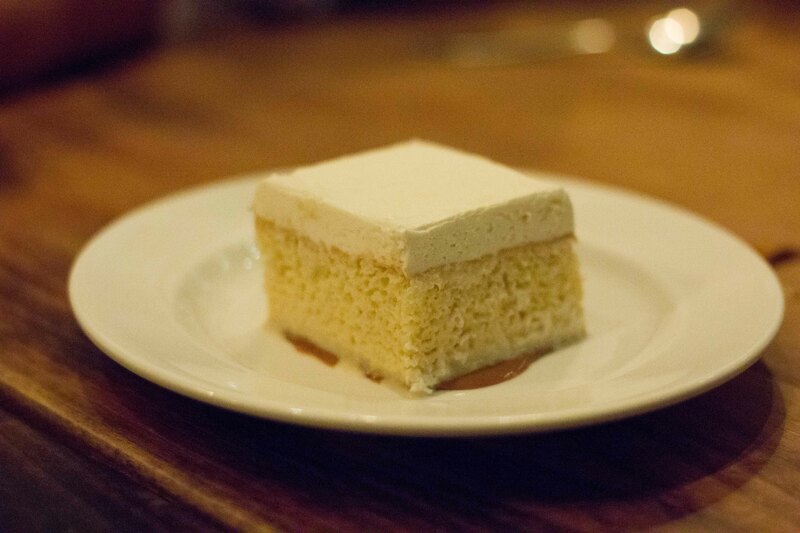 Tres leches, dulce de leche – the winning dessert! Moist and rich without being heavy or too sweet, a hard balance to achieve.